You made it to Friday again! Good job! 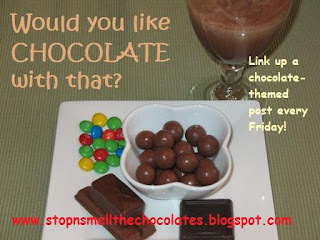 Normally, we have Chocolate Friday - but the first Friday of each month is Dessert Friday so that you can link up any dessert or chocolate post! My Dad has been here visiting, so I haven't made the dessert I was hoping to post. But Dad did help me make one of the desserts that I'll be featuring during my upcoming Fall Fruits Week! What a guy! I'll take this opportunity to tell you a little more about it so you can mark it on your calendars! Let's call it Fall Fruits Festival! It will be October 12 to 17 . The fruits that will be included are pumpkin (yup, it's a fruit - and a vegetable! ), cranberries, pears, and apples. And you know I will find a way to work in chocolate since it's my "favorite Fall food" - LOL! There will be yummy recipes, giveaways, and opportunities to link up! In fact, you will be able to link up every day - one day for pumpkin recipes/ideas, another for apples,etc. What can you do now? Find your Fall Fruit recipe posts and dust them off or write new ones to get ready for the linking. You can also start spreading the word about the Fall Fruits Festival! 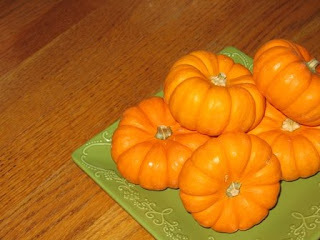 Remember Pumpkin Potpourri Week last year? SO much fun!! Have a fabulous Fall Friday my friends! I'm also linking this up to Your Life, Your Blog at Real Life! Go link up a past post from your own blog and read what everybody else has been up to! It sounds like yet another fun week coming up. I think I'm going to do something like that in November for the week before Thanksgiving or something. I'm still thinking on it. Big you could have at least posted a picture of the "fruit dessert" your Dad made all by himself and teased us size hugs to you. I'm sad to say that I don't have a yummy post to link this morning. I thought I'd stop by anyway to see what's going on and to tell you that I'll be back next Friday with a Chocolate Friday post. YUM!! That sounds like so much fun! Mmmmm... Fall fruits festival sounds so yummy! 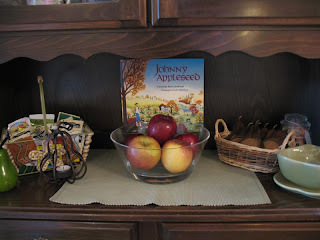 I love all kids of apples!